If you have any questions about the DUBAI MAGIC information page below please contact us. The work of the Aegean Yacht Services yard in Turkey the DUBAI MAGIC is 45 metre 148 (ft) in length. Launched to celebration for 2002 this boat’s interior design illustrates the design knowledge of Platinum Yachts (Refit). She could be described as a recent triple masted schooner. The old, former or build project names were Grand Magic. She will reach a maximum speed of 12 knots. 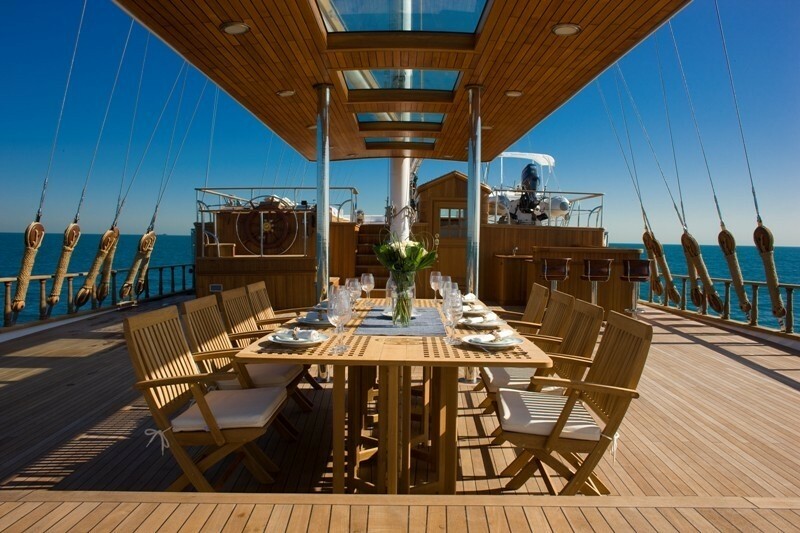 Sailing yacht DUBAI MAGIC combines large open decks which are suitable for sunbathing, outside dining with her similarily large interior spaces which can accommodate up to 26 guests. 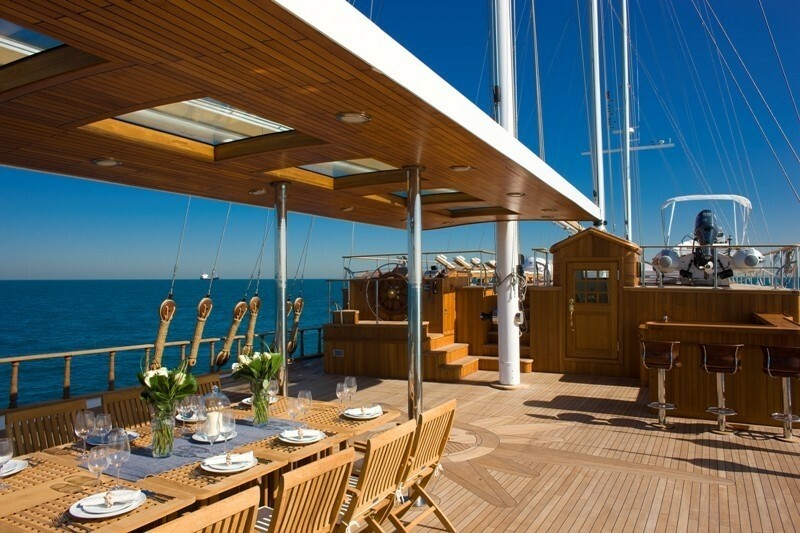 Her saloon is espcially large and along with her dining area it is finished in a classic yacht style. She was converted from a yacht charter boat. 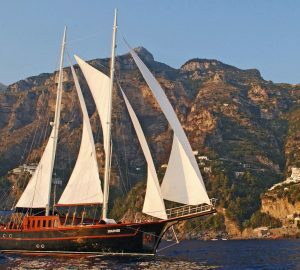 This private sailing yacht is capable of world wide cruising operation and her owners can enjoy smooth sailing and the latest technology. Fitted zero speed stabilizers give provide the superyacht's guests a roll-free enjoyment. The interior design was carried out by Platinum Yacht's Interior Design department and executed in highest possible quality. She has a very warm and relaxing interior for the Owner and his guests. Every guest cabins has it own en-suite facilities with ample storage space. 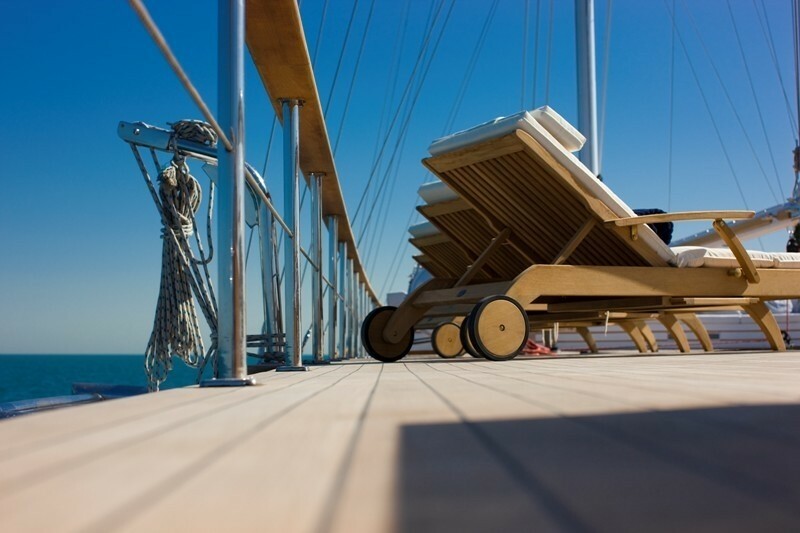 Yavuz Mete was the naval architecture company involved in the professional superyacht composition for DUBAI MAGIC. Also the company Yavuz Mete expertly collaborated on this venture. 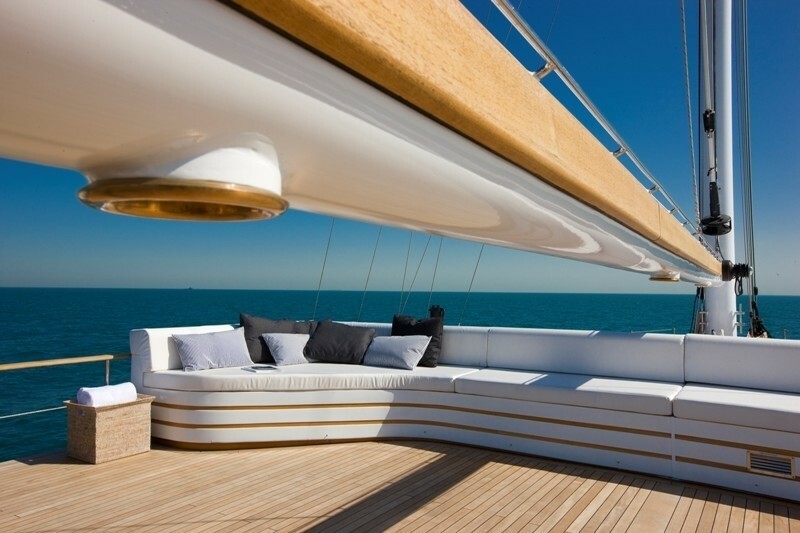 Interior designer Platinum Yachts (Refit) was charged with the overall internal styling. 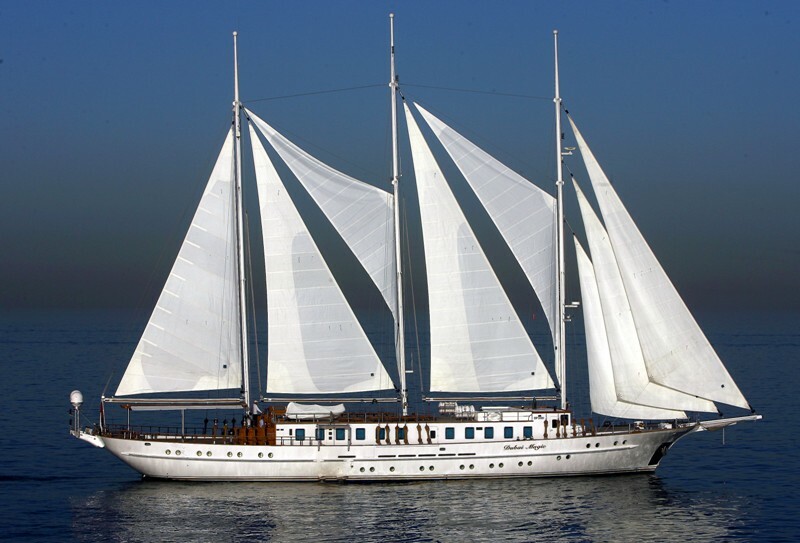 Turkey is the country that Aegean Yacht Services completed their new build sailing yacht in. After her official launch in 2002 in Bodrum the boat was handed over to the owner following sea trials and testing. A fairly large area is achieved with a widest beam (width) of 10 metres / 32.8 feet. With a 3.81m (12.5ft) draught (maximum depth) she is reasonably deep. The material steel was used in the building of the hull of the sailing yacht. Her superstructure above deck is created out of steelandwood. Over the deck of DUBAI MAGIC she is 45 (147.6 ft) in length. In 2007 further refitting and modernisation was also performed. For propulsion DUBAI MAGIC has twin screw propellers. The main engine of the yacht produces 480 horse power (or 353 kilowatts). She is equiped with 2 engines. The sum power for the yacht is therefore 960 HP / 706 KW. Apportioning quarters for a limit of 50 visiting passengers overnighting, the DUBAI MAGIC accommodates everyone luxuriously. 45 metres / 148 feet. Main Engine(s) is two 480 Horse Power or 353 Kilowatts Caterpillar. The luxury yacht DUBAI MAGIC displayed on this page is merely informational and she is not necessarily available for yacht charter or for sale, nor is she represented or marketed in anyway by CharterWorld. This web page and the superyacht information contained herein is not contractual. All yacht specifications and informations are displayed in good faith but CharterWorld does not warrant or assume any legal liability or responsibility for the current accuracy, completeness, validity, or usefulness of any superyacht information and/or images displayed. All boat information is subject to change without prior notice and may not be current.